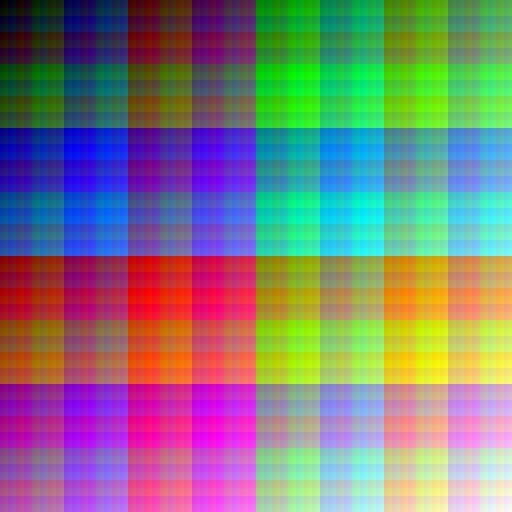 Similar to the images on allrgb.com, make images where each pixel is a unique color (no color is used twice and no color is missing). 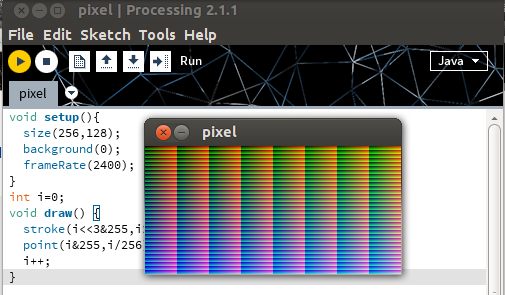 Give a program that generates such an image, along with a screenshot or file of the output (upload as PNG). Create the image purely algorithmically. 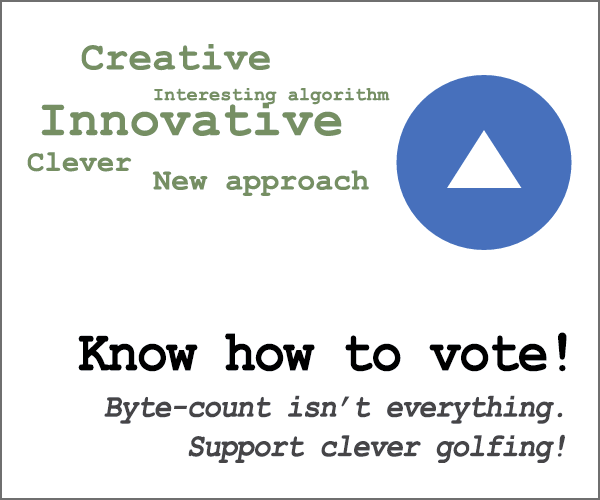 This is not a short code contest, although it might win you votes. If you're really up for a challenge, do 512×512, 2048×1024 or 4096×4096 (in increments of 3 bits). Scoring is by vote. Vote for the most beautiful images made by the most elegant code and/or interesting algorithm. 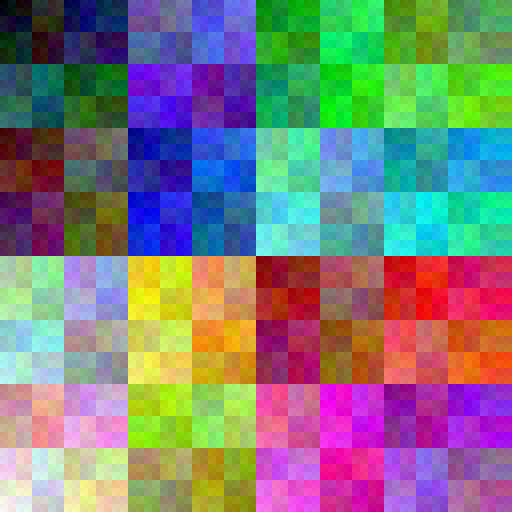 Two-step algorithms, where you first generate a nice image and then fit all pixels to one of the available colors, are of course allowed, but won't win you elegance points. 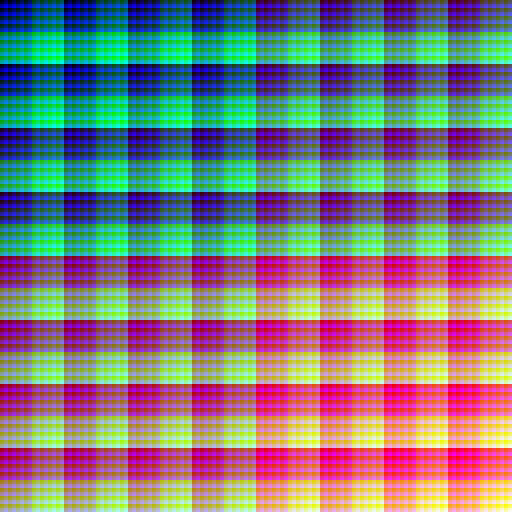 * 15-bit colors are the 32768 colors that can be made by mixing 32 reds, 32 greens, and 32 blues, all in equidistant steps and equal ranges. 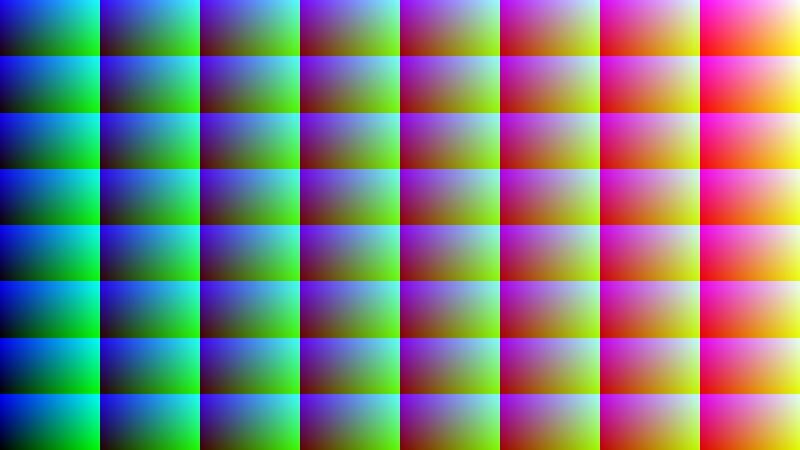 Example: in 24 bits images (8 bit per channel), the range per channel is 0..255 (or 0..224), so divide it up into 32 equally spaced shades. However, by no means, think this is over. I, and all readers, always welcome more awesome designs. Don't stop creating. Not pretty like many of the other answers, but it uses the GIF format in an interesting way. I used to make these infinite recursive sorters when I was learning to write code, very rewarding to program so little. 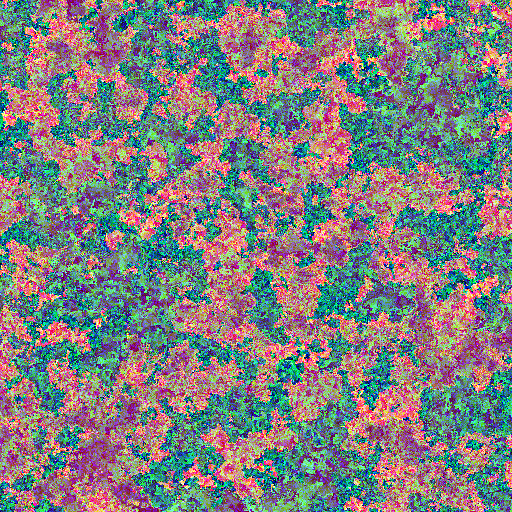 It will eventually converge around something like below for random colors - but it has the very unique property of continuously walking. Try experimenting with the lambda_x and lambda_y functions and enjoy your exploration of the multidimensional! Look mom! I've shaken the colors away! print x^4+y^4+z^4"\t"x" "y" "z | "sort -n | cut -f2-"
If you think this is fun, read about the PBM, PGM and PPM picture file formats. They may look like a fossil but who says that this means "no fun!"? 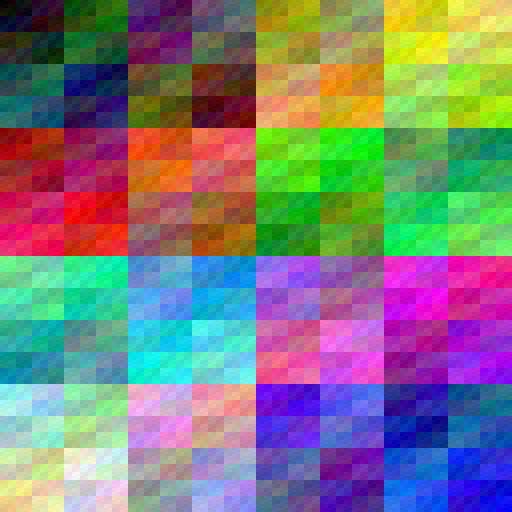 It saves the full 4096 by 4096 version to the file "the_colors.jpg" and then draws a 1/8-size preview onto a JFrame. It typically takes 35-40 seconds to generate the result. Each run produces one of ~1.3 trillion possible outputs. Requires ImageMagick's display command. Try changing w / h to 512 / 512 or 2048 / 1024 for more colors. Uses the same algorithm as the given example, but gives an animated output! 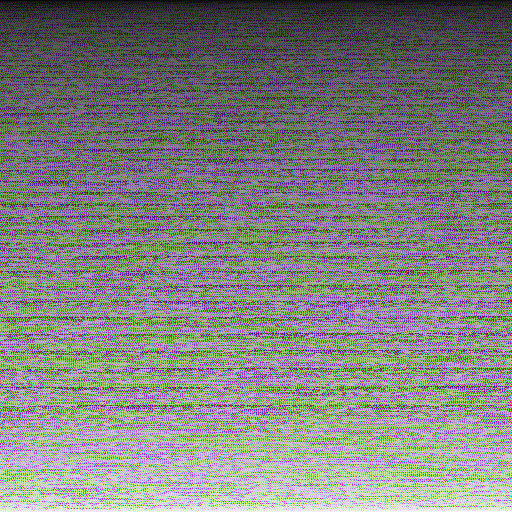 Isn't it fun just to stare at your computer screen as the pixels slowly fill up one by one? See it run online here. 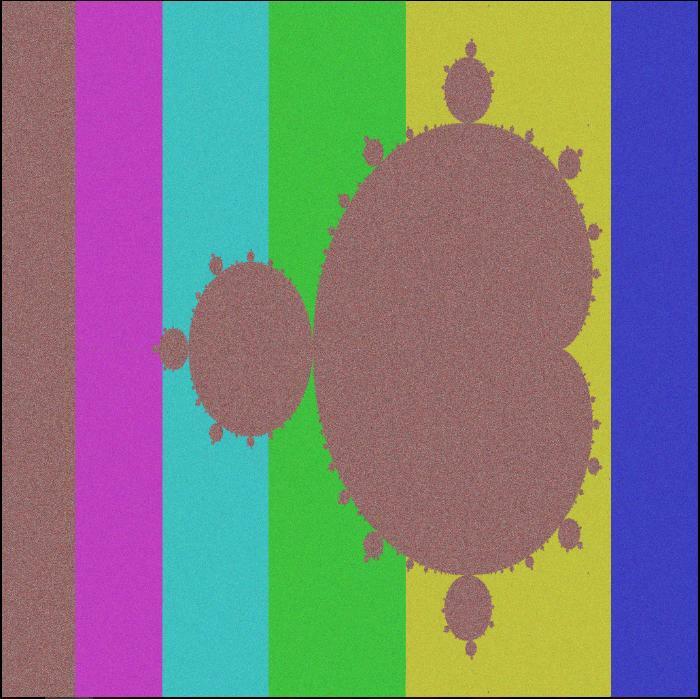 The program attempts to color a Mandelbrot using every color. Naturally, this ensures that there are two parts of the program that take a long time: the color generation, and the Mandelbrot generation. 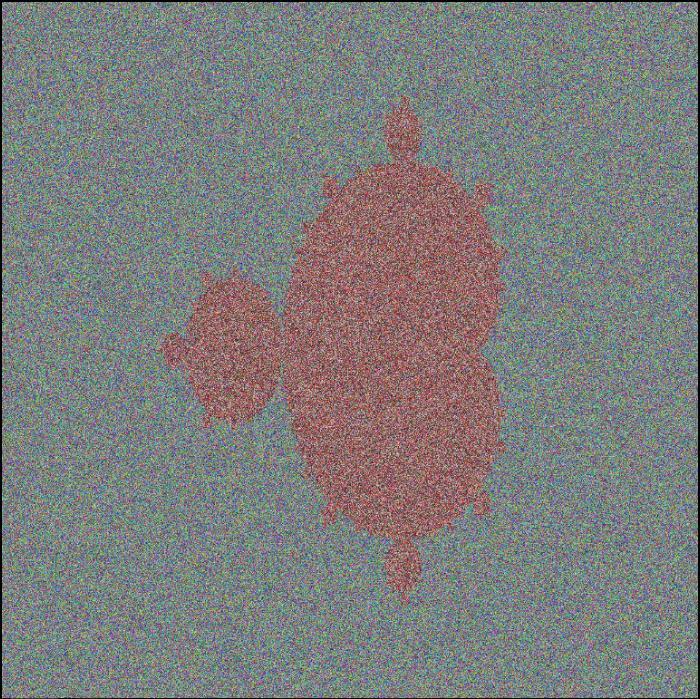 For each pixel of the image, I compute whether it is in or out of the Mandelbrot, before estimating the exterior difference for each exterior point. The interior distances are currently all set to 0. 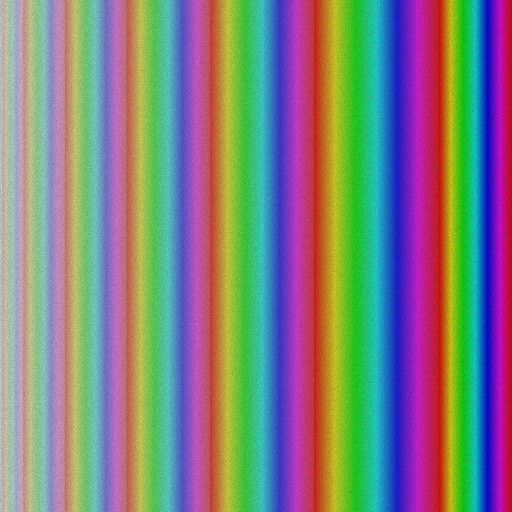 At this point, we sort according to the distance to the Mandelbrot Set, then grab the (sorted) color at the same position in the sort as the pixel. 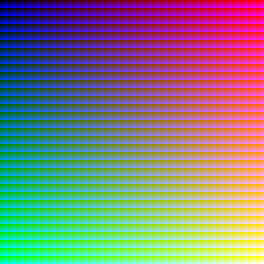 To sort the color, I compute the hue and saturation according to these formulae. 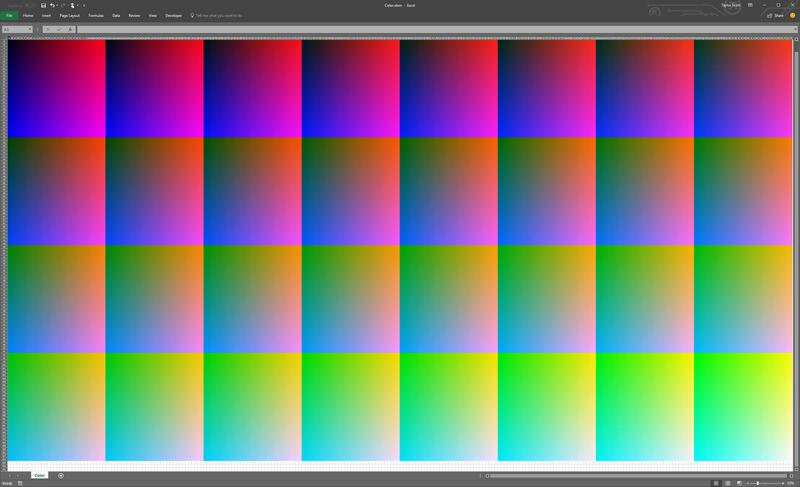 I sort by saturation, with hue coming in afterwards. BigDecimal h1 = delta1.compareTo(BigDecimal.ZERO) == 0 ? : cmax1.compareTo(r1) == 0 ? : cmax1.compareTo(g1) == 0 ? BigDecimal h2 = delta2.compareTo(BigDecimal.ZERO) == 0 ? : cmax2.compareTo(r2) == 0 ? : cmax2.compareTo(g2) == 0 ? BigDecimal s1 = delta1.compareTo(BigDecimal.ZERO) == 0 || divisor1.compareTo(BigDecimal.ZERO) == 0 ? BigDecimal s2 = delta2.compareTo(BigDecimal.ZERO) == 0 || divisor2.compareTo(BigDecimal.ZERO) == 0 ? I was inspired by my answer from another popularity contest question which used iterative depth-first search to generate a maze. 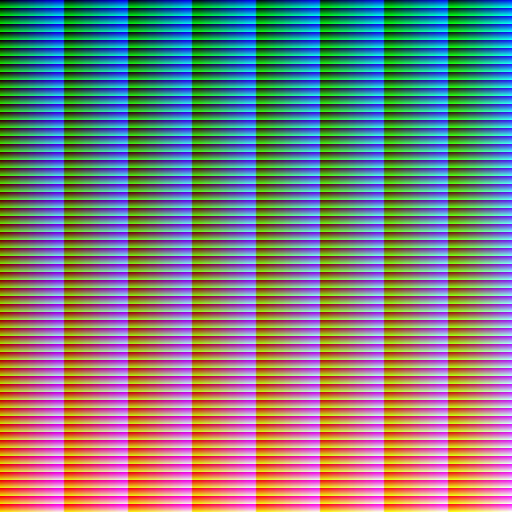 I used a variation of the algorithm used in a couple other answers that determines the best color to place at a certain pixel given the colors occupying the neighboring pixels. 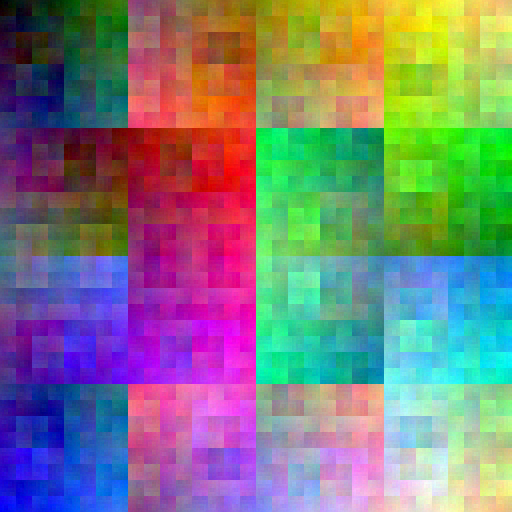 The algorithm starts at the center pixel and works its way visiting every pixel in the image in a random path. The code is set up so that one can change the fields to give different results, such as adjusting the width and height of the image (and all relevant colors are used depending on the dimensions), random seed, and whether to shuffle or sort the colors before placing them from the list onto the image. Sorting is done using the HSV color model. 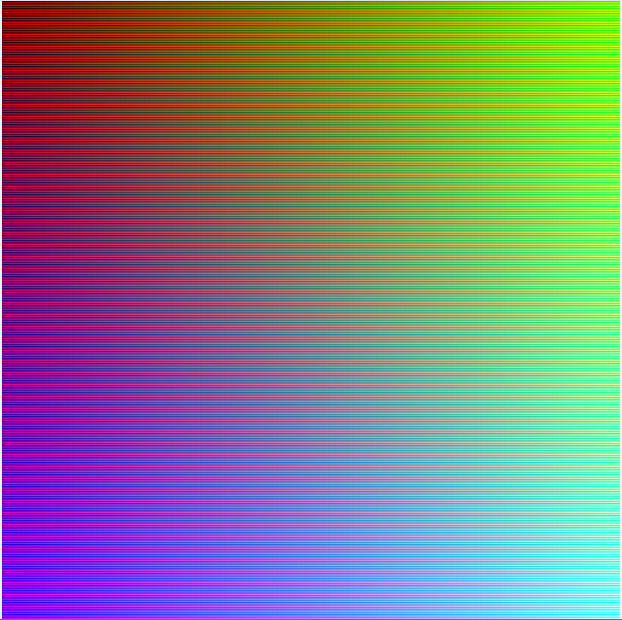 The resulting image will appear in a window once the image generation has finished. Scroll panes may be added for convenience in larger images. Assuming searchLimit = 8, on my machine it takes seconds to produce 256x128 and 512x512 images, around ten minutes for 2048x1024 images, and half a day or longer for 4096x4096 images. * to produce the image. 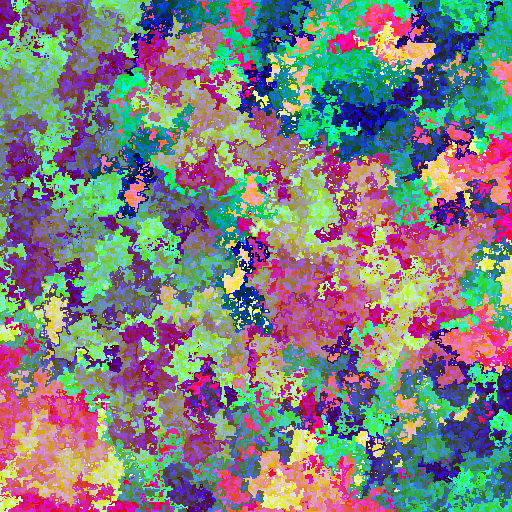 * Seed for the color list shuffling and depth-first search algorithm. * Using 'null' will create a random image every time the program is run. * List of all colors. * You can sort by one method first and then by another; e.g. * Flags for shuffling and sorting the values in the list. * ascending order by their numerical value. * may give interesting results! 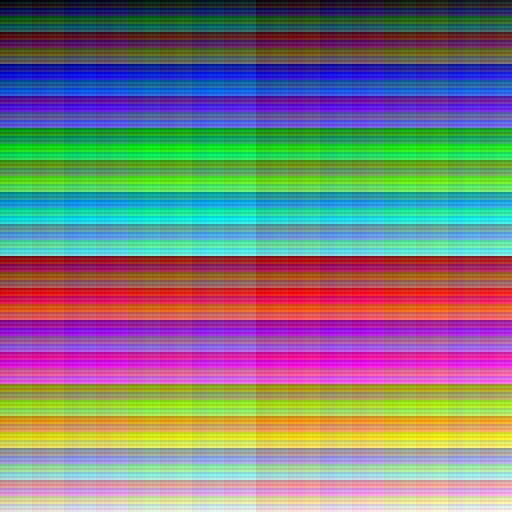 The next three are 512x512, use seed = 24680L, and shuffled the colors in the list without sorting them afterward. The searchLimit was the only thing that changed between them, producing interesting results. 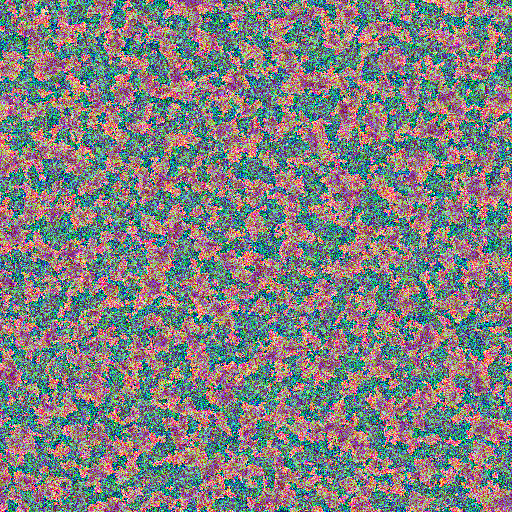 Linked are 2048x1024 images, with seed = 24680 and the colors sorted by hue. Some interesting differences arise when modifying the searchLimit again. The ones used here are searchLimit = 8 and searchLimit = 512. 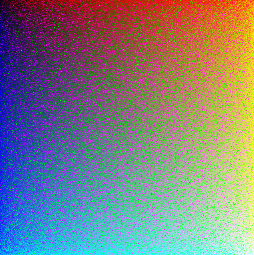 And last, but certainly not least, linked is a random 4096x4096 image with searchLimit = 8 and sorted by hue. I'm still trying to figure out how to remove those lines. I know I'm a late to this discussion but I thought I would post my attempt to this thread just in case it is useful/interesting to anyone. The live editable version can be found here xy2rgb3/rgb3toxy2. Xorshift is a type of PRNG which is very fast and somewhat reliable. A 16bit Xorshift generator will cycle through the numbers 1 to 65535, so for this task we skip any with the high bit set. What it won't do is ever produce the number 0, so we start painting at the second pixel. Each seed will produce the same result, and if you like you can try other seeds. Try it online. Non-competing because the builtt-in HilbertCurve was introduced in Mathematica 11.1 in 2017. Inspired by Joe K's answer. 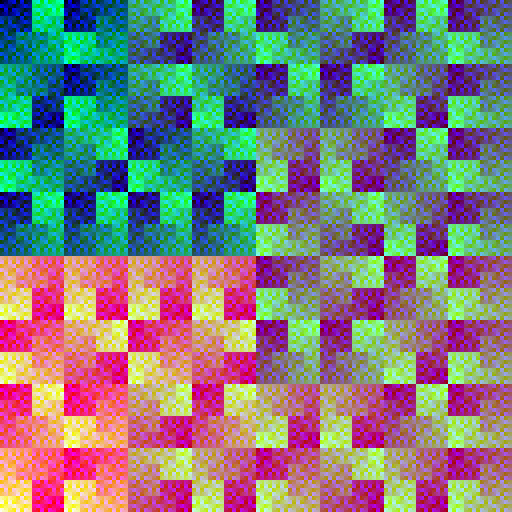 Generates 9 images in one program. Arranges the colors in three different orderings: the lexicographical order, the Z-order curve, the Hilbert curve; then places them in the image in (the 2-dimensional version of) these three orderings. 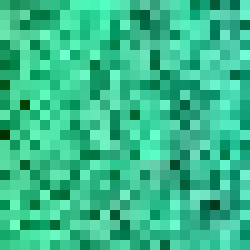 A declared subroutine that takes no input and outputs to a 256 x 128 cell image to the range A1:IV128. For this algorithm, red values change as a function of the column number, blue values changes as a function of row number and green values change as a function of both the column and row number, with low values falling at the top left and high values falling at the bottom right.[! 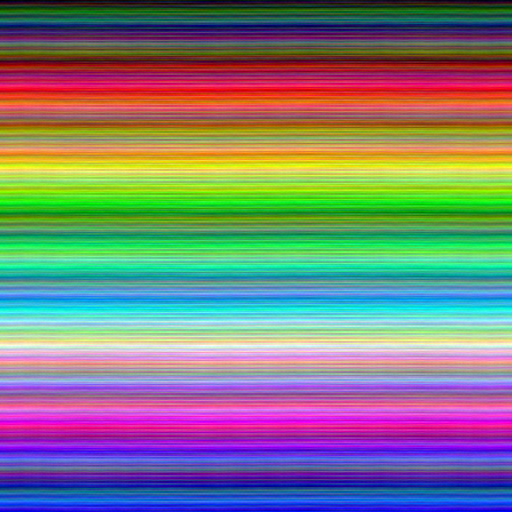 This may be golfed down to a VBE immediate window function worth 165 bytes. Not the answer you're looking for? Browse other questions tagged popularity-contest graphical-output color or ask your own question.